I learned a little bike repair on my more modern Bianchi Strada, which seems to use pretty standard metric sizing on the nuts and bolts and screws. I can adjust just about anything on that bike with a little multi-tool and basic wrench set. This bike is more complicated. So far, nearly everything I disconnected has been an odd size; even with my ratchet set, I don't always have the size I need. I should probably get an adjustable wrench! This morning, I pulled out the seatpost. It was not too difficult to remove, but a bit sticky, just like everything else on this bike. It's going to get a lot of grease and oil and lube when I put it back together. I broke the chain so that I could remove it and the rear derailleur from the frame. Here's what the pulleys on a new derailleur are supposed to look like. 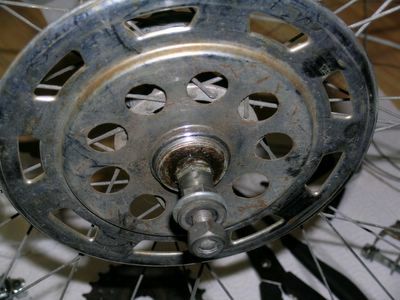 Now closely examine the pulleys on this photo of my derailleur. Can you tell what is missing? That's right: the teeth are entirely worn down! Forget about being able to shift gears with this thing, I'm surprised that the chain could even run through it. Not to mention that the chain itself is all sticky and gummed up. I didn't have the tools needed for a full disassembly of my bike, so I took it down to Sibley Bike Depot to use their shop for a few hours. With a little help from the regulars, I was able to remove my freewheel, crankset, stem and fork. The frame was completely stripped and I had the components in piles. I thought about taking everything home in pieces for a thorough cleaning but decided to reassemble it at the shop just in case I ran into any problems. Boy, am I glad that I did! It turns out that building a bike back up is a lot harder than taking it apart. Besides all the parts that had to go back in the same places, I had to make sure that everything was properly cleaned, adjusted, lubricated, and (in the case of some ball bearings) replaced. In the end, we did get my bike back together. I spent about five hours at the shop, but a lot of that time was spent chatting with the diverse crowd that hangs out there. It sure beats a day at the office. Just so you know -- the derailleur pictured on your site is most likely a Simplex or Huret model, and the pulleys are supposed to be like that. 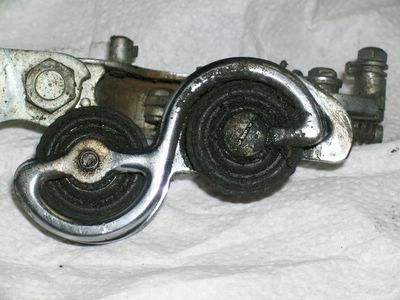 Pulleys on French derailleurs were often toothless (or sometimes teeth were only on one of the two pulleys. I just stumbled across your blog, and it is funny because I bought a Belgian/French "Astra" bicycle only yesterday to do a similar conversion (fixed/free). My bike is spec'ed much like your Batavus was originally.